"It is with great sadness that I share with the 49er family the passing of Bob Young. 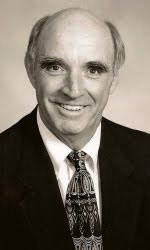 Bob served as Executive Director of the Athletic Foundation from 1993-1998 and as Director of Planned Giving and Major Gifts from 1998-2000. "Under Bob's leadership in the 1990's, the Athletic Foundation saw tremendous capital growth. Bob was instrumental in securing gifts that helped build athletic facilities such as the Wachovia Fieldhouse, the Irwin Belk Track and Field Center, the James H. Barnhardt Student Activity Center and the Miltimore and Wallis Athletics Training and Academic Center. "Visitation will be held at River Hills Community Church Friday from 6 to 8 p.m.. Services will be held at River Hills Community Church Saturday at 2 p.m. Interment will be held immediately following the service at River Hills Community Church Cemetery."